Skinny Puppy was one of the most innovating bands in the industrial music history. Since the death of Dwayne Goettel in 1995, fans of this ground breaking group have come to terms with the end of this legacy. Many are keeping the spirit of the band alive in methods of preservation, dedication, and resurgence. "Remix Dystemper" contains original Skinny Puppy songs remanufactured by miscellaneous artists. Songs like "Rodent," "Addiction," "Smothered Hope," "Killing Game," "Worlock," "Tin Omen" and "Assimilate" are remixed by the likes of Gunter Schulz of KMFDM, Mark Walk, Autechre, Rhys Fulber of FLA, Josh Wink, Chris Vrenna, God Lives Underwater, and The Deftones. "Worlock" and "Assimilate" are the only tracks on the CD that are even remotely similar to the original song. The musical content is very danceable, genuinely well assembled, and produced accordingly. 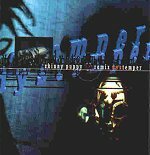 However, the content of "Remix Dystemper" is incomparable to the original Skinny Puppy sound and it is better noted as a remix album with a flavor all it's own with no continuation of the band's musical style.